It was a frosty morning to be outside finishing the latest piece for my interiors project, but the deadline is looming. There was nothing for it but a large cup of tea, flapjack and a lot of elbow grease (as my grandfather would have said) to finish the waxing and varnishing. And tah dah, here they are. I picked up this pair of Uniflex 1960s or 70s bedside tables, along with a similar dressing table at Sunbury Antiques market a few weeks ago. The bedside tables had been given a heavy coat of dark varnish at some point. I sanded them down to reveal the chevron veneer. A light coat of Ronseal quick dry matt varnish, which is low V.O.C. (volatile organic compound) brought out the wood grain beautifully. I sanded around the top of the bedside table to reveal the layers of plywood, as I like the detail and the honesty of showing the plywood. The tables were still a dark colour, so I painted the sides with Annie Sloan’s chalk paint in Paris Grey to soften them. Once dry, I waxed the sides with Annie Sloan clear soft wax. Finally, I covered the top of the tables in some off-cuts of a linen fabric from Christopher Farr, that was made in England. The fabric, called Carnival, has a vibrant, bold green and blue print. I used a natural latex universal adhesive from Auro to stick the fabric down before giving it a couple of coats of varnish once dry. The bedside tables are no longer pure mid-century modern, but with a gentle refresh will sit well in a contemporary bedroom. If you D.I.Y., you can have just the colour or fabric you want. And be bold, all of the changes I made be undone, and it’s fun to experiment. Oh and the Guardian article below has an easy step by step. 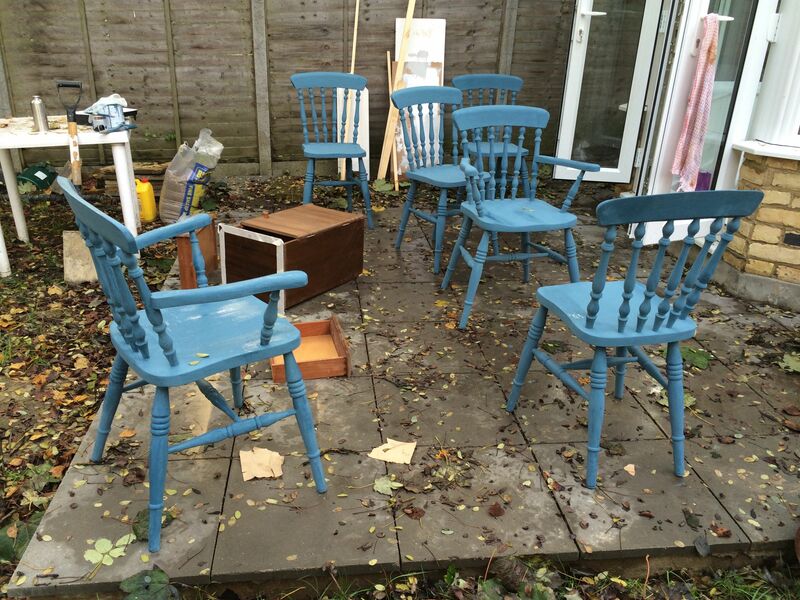 Or look out for local furniture restoration and painting classes, with a quick web search. 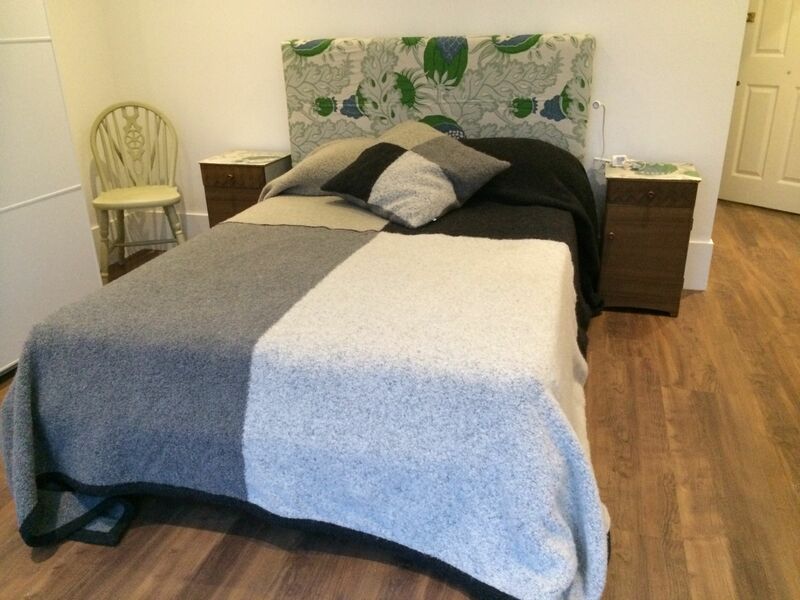 In London, try the Goodlife Centre (S), Phoenix on Golborne (W), or get a bit of help from Revived London (SE). Part of the haul from the Sunbury Antiques Fair was a mid-century nest of tables that had seen better days. With a tighten of the screws, wash and wipe it was ready for a refresh. The set are destined for a newly refurbished flat that could do with an injection of colour. As the tables are quite small, you can be bold without overpowering a room. The tables were given a light sand, and then painted in Annie Sloan chalk paint. The chalk paint leaves a subtle, matt finish once dry. Then it was time to embark on my first decoupage project. I had some Liberty print fabrics, and chose to use the Angelica Garla A (£22 per m) as although floral it has strong colours such as navy, olive, mustard yellow, and turquoise. First of all, I applied the adhesive to the smooth, clean surface. You could use any universal adhesive, I was using Auro‘s universal adhesive which is made of natural latex. I diluted the adhesive slightly for easy application. I applied the fabric being careful to smooth out any wrinkles, trimmed around the edges and left the adhesive to dry. Once dry, I used a matt varnish also from Auro to apply two coats and seal the fabric. I used Annie Sloan’s soft clear wax to finish the painted surfaces, and voila! The smallest table has been claimed by my daughter as her new bedside table. The whole process was fun, and a straightforward way to revive and personalise the nest of tables. For a simple DIY guide to decoupage check out Channel 4’s web page. I recently spent a morning down at the Phoenix on Golborne, an antiques and vintage home wares shop just off the Portobello Road in London, getting to grips with painting furniture. The class covered basic tips and advice on a range of finishes and paint effects using the Annie Sloan range of paints and waxes. Annie Sloan’s chalk-based paints are really versatile as they can be used on any surface, without priming, sanding or preparing, so very forgiving for the enthusiastic amateur. The paints are extremely low VOC (volatile organic compounds) so kind to you and the environment! 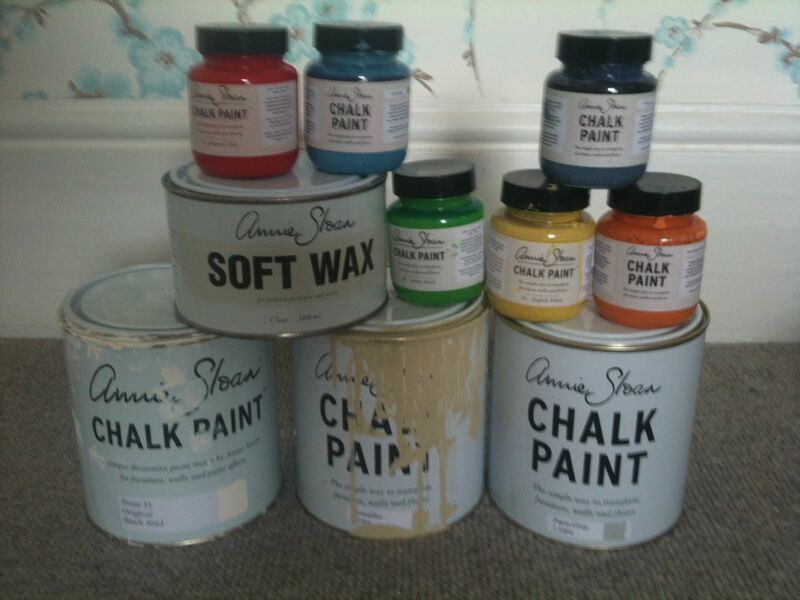 The Annie Sloan website is full of advice and inspiration on colour mixes and combinations. 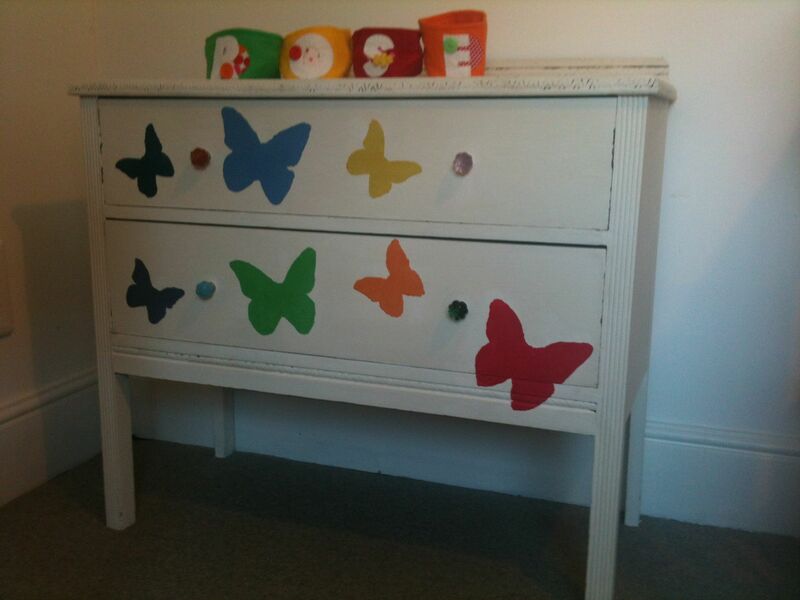 My first experiment was with a chest of drawers I found abandoned on the pavement, and just what I was after for baby R’s room. It did need a bit of sanding to get rid of the yellowing, flaky old varnish, but after a few coats of the quick drying chalk paint and I had a blank canvas to experiment with some homemade stencils……..
Not bad, for a beginner!